The 13th Century, considered with reason the most brilliant age of the Catholic faith, was nevertheless a period in which great sufferings, and still greater errors agitated the Church, convulsed Europe, and Italy more especially; but in proportion to the magnitude of the evil was the efficacy of the assistance afforded to the Church of Christ by Her Heavenly Spouse. The sons of the heroic Gusman, the disciples of the Seraph of Assisi, the children of the great St. Augustine, and the religious of Mount Carmel were rapidly formed into a valourous army, which ranged in battle array throughout Europe, renewed the miracles and the virtues of the first christian ages, and once more bore witness to the truth of the Divine promise, that the gates of Hell should never prevail against the Church (St. Matth, xvi. 18). To these four Institutes was added at an early date, that is in the year 1233, the Order of the Servites of Mary, established for the special end of propagating a tender devotion towards the Mother of the redeemed, and destined to produce a most immediate fruit, by its strenuous exertions against the division between the Guelphs and Ghibellines, then desolating Tuscany, the country which had given it birth, according to Scipio Ammirato in his account of the rivalship between the patrician families of the Amedei and the Buondelmonti. The name of Servites or Servants of Mary bestowed on this new Order was not suggested by human wisdom but proceeded first from the innocent lips of tender infants at the breast, amongst whom was St. Philip Benizi, then five months old. These little babes, beholding the Founders of the Order for the first time, suddenly and to the unfeigned wonder of their mothers and of all the city of Florence, broke out into articulate speech, exclaiming: “Behold the Servants of Mary.” The Founders were seven Florentine patricians, who according to the custom of that epoch, were also engaged in commerce; their names were: Bonfiglio Monaldi, Giovanni Manetti, Benedetto dell’Antella, Bartolomeo Amidei, Ricovero Lippi-Uguccioni, Gherardino Sostegni, and Alessio Falconieri. They were members of a pious confraternity called the Laudesi, which possessed a small chapel on the very site where a little later the famous Giotto constructed from his own designs, the magnificent belfrey of the metropolitan church of Florence, admired at the present day as one of the masterpieces of art which adorn the capital of Tuscany. The abovenamed sodality had been instituted to celebrate the praises of Mary the chosen daughter of Sion, and to appease by her intercession the divine wrath, which exasperated by the intestine divisions and fierce passions of the Florentines, was visibly pursuing the guilty republic with signal chastisements, and menaces of still greater severity. This pious Society soon increased both in numbers and reputation, in consequence of the shining virtues practised by the seven young patricians who had unconsciously become the example and the admiration, not only of the nobility of Florence, but of the entire city. They were, however, as modest as they were pious, and sedulously avoiding whatever might disturb their profound humility, they devoted themselves solely to the promotion of God’s glory, the peace of the commonwealth, and their own sanctification. Animated by these sentiments, they were pouring forth their hearts before the altar of their heavenly Queen, on the Feast of her Assumption into heaven, in the year 1233, when each one of the number felt himself overpowered by a certain celestial sweetness and ineffable emotion, and being rapt in ecstacy, beheld a wonderful light divided into seven resplendent rays one of which was directed towards himself, and at the same time he heard a voice calling him to a new and perfect way of life. He then saw the Blessed Virgin herself surrounded by a bright light, who invited him to follow her, and sweetly smiling disappeared. The interior wonder and fervour of spirit which took possession of the privileged youths after this consoling vision can be more easily imagined than described. Suffice it to say that the other members of the confraternity having departed, these seven remained absorbed in prayer, and with their eyes full of tears of gratitude and love, gazing wistfully at one another, as if not knowing what to do or say in the overflowing plenitude of their devout affections. Silence was at length broken by Monaldi, the eldest of the seven, and the chosen friend of all the others. He declared the vision and supernatural call with which he had been favoured to his six companions, and learned with astonishment that the vision, the call, and the inward desire to comply with the invitation of their divine Mother was common to all. It was at once determined by them to carry the pious inspiration into effect on the approaching festival of our Lady’s Nativity, and in the meantime to renounce their worldly possessions, to disengage themselves from family ties, to relinquish the public offices which some of them held, and to implore the advice of the Bishop, and his blessing on their undertaking. All this they punctually executed amidst the tears of their relations and friends, and to the amazement of the whole city. Encouraged by the exhortations and blessing of the zealous Bishop Ardingo Trotti, and clothed in humble garments, they retired to a small house called Camarzia, situated on the spot now occupied by the magnificent church of Santa Croce, celebrated for the marvellous works of art which it contains. It was at this period, that after having fixed upon their mode of life, and the special devotions to be practised by them in honour of their heavenly Mother and Advocate, as they were proceeding together for the first time to the Bishop's palace to obtain his approbation of what they had decided, they found themselves unexpectedly greeted by the title of Servants of Mary by little infants in their mothers’ arms, and the salutation was immediately taken up, and repeated with loud acclamations by the multitudes gathered together on their path. This extraordinary and supernatural occurrence, increasing the veneration felt toward them by all classes of their fellow citizens, proved an occasion of great trial to their shrinking modesty, for they were besieged and importuned on all sides by numbers who sought their counsel and direction in spiritual matters. They had recourse therefore to the Blessed Virgin, in order to learn from her how they were to escape from their present vexations, and from the more serious difficulties which they apprehended. In answer to their prayer, the Queen of Heaven vouchsafed to shew them in a vision, the mountain of Senario, making them understand that this was the spot in which it was her will that they should take up their residence. Full of joy at this new favour, the seven penitents hastened to the Bishop, who loved them like his own children. They related what had happened, and he not only consoled them with the kindest words, but gave them a material proof of his good will by generously bestowing upon them the Forest of Senario which belonged to him. Upon this they immediately collected their poor furniture, and accompanied by their confessor and carrying the crucifix and the image of Mary, (their design being unknown to all but the Bishop and their confessor) they set out on the 31st of May, 1234, which was that year the Vigil of the Ascension, and proceeded to Senario distant about three leagues from Florence. Having reached the summit of this steep mountain, they fell on their knees, and prostrating themselves before the image of Our Lady, exclaimed: “Behold O heavenly Lady, we have left all things and have followed thee, our Mother.” Then they took shelter in some caverns which they discovered near the top of the mountain, and the next day raised an altar adorning it in the best way they were able, for the celebration of the Holy Sacrifice, and having constructed a small oratory and some huts with the branches and leaves of trees interlaced together, the Seven Blessed Fathers began to lead a life more angelical than human, exercising themselves in every kind of virtue and penance, passing their days and nights in prayer and in singing the praises of their celestial Queen, and procuring the bare necessaries of life by alms, which they begged from door to door in the streets of Florence. A life of such eminent virtue, and of such austere penance as to renew in Senario the rigours of Thebais, could not long escape from public admiration, in fact the whole of Tuscany soon resounded with the fame of the seven holy penitents. The Cardinal Castiglioni, afterwards Pope Celestine IV, was induced by the fame of their sanctity to visit them at Senario, when finding that the reality far surpassed all that he had heard, he felt himself obliged to exhort them, in unison with their Bishop, to moderate the extreme rigour of their life; he likewise recommended them to receive some of the many candidates who desired to consecrate themselves to the service of God and our Blessed Lady under their guidance. The Blessed Fathers promised the required mitigation of their austerities, but observed at the same time that as it had never entered into their minds to found a new Order, and as they simply wished to expiate their own sins, and work out their own salvation they felt it impossible to admit others into their mean and humble company. To this the Bishop rejoined that they ought not to take the decision of so important a point upon themselves; that many aspirants were ardently desiring to join them; that the good to be expected from their reception was very great; consequently, it was necessary to implore the light of Heaven, and to consult the will of the Blessed Virgin in an affair of so much moment. It was therefore settled that they should offer up special prayers for this purpose, and the Cardinal and Bishop, much edified and affected by what they had seen, shortly after left Senario. The prayers of the Blessed Fathers meanwhile rose up to Heaven, and were favourably heard. A vine which they had planted near the summit of the mountain, suddenly brightened into leaf, and blushed with rosy grapes, while a considerable tract of the surrounding soil was covered with verdure and blooming flowers, though the season was severe, and it was near the close of the month of February. The Bishop being informed of this event, applied himself immediately to prayer in order to discover its hidden meaning, and he beheld in a vision a vine divided into seven branches, each of which separated into seven others, and all grew up, increased, and flourished in beauty and fertility. Then the mother of God appeared to him and pointing to the vine, declared it to be her chosen plant, destined to bring forth during many ages, plentiful fruits of virtue and of honour. Upon this, the Bishop hastened to Senario, made known with an exulting heart the future blessings symbolized by the wonderful vine, and related his vision touching the increase and propagation of the new Order. 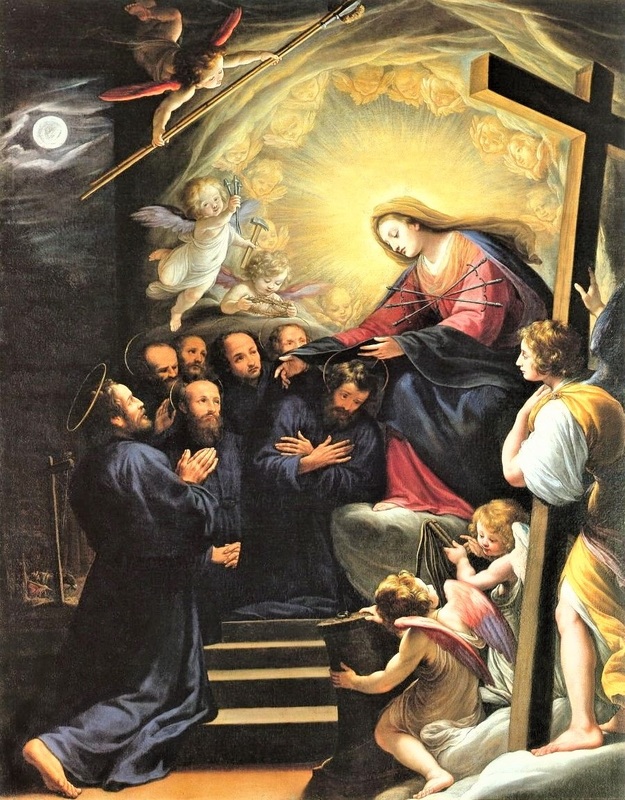 He found the Servants of Mary resigned to the divine will, and it was unanimously agreed that the reception of a few postulants should be preceeded by a triduo, to be celebrated during the three days before the approaching Feast of Easter, for the purpose of obtaining light to discern more clearly the good pleasure of the Almighty. This intention was carried into execution, and on the evening of the ensuing Good Friday, our Blessed Lady appeared to them robed from head to foot in a long black mantle, and surrounded by a numerous troop of Angels bearing the instruments of the passion, the emblem of the Servite Order, the Rule of St. Augustine, and many habits of the same colour as the Virgin’s mantle. Taking these garments in her hands, she distributed them to the Seven Fathers, ordaining that they and all who were to follow in their footsteps should wear them, not only in memory of her bitter sorrows and anguish, but also in token that this pious remembrance was, through their means, to become perpetuated on earth. Having said these and similar things the heavenly Foundress of the Servites disappeared, and the first Fathers of the Order, recovering from their stupor, dried their tears and being again warmly encouraged by the Bishop, put on the habit indicated to them by the Queen of Martyrs, and at the same time admitted many others to the same great privilege. In consequence of these events and of the evident manifestation of God’s holy will, it became necessary that the Founders should turn their attention towards the means of obtaining a recognition of their Order from the Holy See. A partial success rewarded the efforts made with this view by Monaldi, who had been elected head of the new Institute. He obtained at Fermo, on the 13th of March, 1249, from Cardinal Raniero Capocci, Legate of the Pope in Italy, the protection of the Holy See in favour of the Order, the ratification of his own powers as its superior, and license to admit to the holy habit as many as should desire it. Although Monaldi had obtained a great deal from Cardinal Capocci, there remained much more to be conceded before the Order could be considered as in possession of the full and absolute approval of the Holy See, a thing most difficult to obtain at that time, when it was customary for the Holy See to proceed with the utmost caution, on account of its being well known that there were many who concealed the most perverse intentions under the mantle of piety. Nevertheless, as the Blessed Seven were now intimately convinced of the will of the Blessed Virgin concerning the perpetual duration of the new Institute, they endeavoured, as was indeed their duty, to procure this final approbation by unremitting efforts and incessant prayer, and they were the more earnest in the business, because in compliance with the wishes of many of the Bishops several houses of the order were already opened in Tuscany, and they were continually receiving petitions for new foundations. They, therefore, steadfastly pursued their holy purpose, receiving still further encouragement from St. Peter Martyr, who visited the fervent penitents of Senario by command of Innocent IV, and became their apologist, as well because he was convinced by his own experience of their virtue, as because he had learned in a vision that they were the objects of the special protection of the Blessed Virgin. Finally it was settled that Monaldi, accompanied, by some of the others, should present himself before the Sovereign Pontiff, who had recently returned to Italy after the death of the impious Emperor Frederic Barbarossa, which took place in Apulia, December 13th, 1250. Father Bonfiglio accordingly proceeded to Perugia where the Pope at that time resided, and having on his way converted a manichean who had insulted him, he threw himself at the feet of the Vicar of Christ, who received him with the greatest affection, and as an unequivocal mark of his favour, appointed his nephew Cardinal Gugliemo Fieschi, protector of the Order. At the same time the Pope gave hopes that within a brief delay, when the new Institute should have become a little more matured and consolidated, he would grant it his full and unconditional approbation. However, the vicissitudes of the times, and the difficulties arising from the rule of the fourth Council of Lateran, which fixed the number of the Regular Orders, prevented Innocent IV from fulfilling his promises. The wishes of the holy Fathers were, however, in great measure granted by his sucessor, Alexander IV, who, by a Letter Apostolic, dated from Naples, May 26th, 1255, conceded to Monaldi favours and privileges for the Order, equivalent to a complete approbation. The existence of the Order being now secured from every danger, the seven Blessed Founders and their first disciples applied themselves seriously to the work of propagating a tender devotion to the Dolours of their heavenly Mistress, this being the fulfilment of the mission imposed upon them at Senario, and the means whereby they were to render all the faithful partakers with them in the holiness of life accompanying the practice of this devotion, and in the eternal glory and heavenly palms, promised by the Blessed Virgin in the above named vision, to all such as, under the name of her Servants, should have made it their study to sympathize with her in her bitter sorrows. Not content, therefore, with venerating their divine Mother by every kind of homage; greeting her with the Ave at the commencement of mass and with the Salve Regina at its close; fasting every Friday of the year in memoriam suscepti habitus, ac humanae redemptionis reverentiam (in memory of the reception of the habit, and of man’s redemption); honouring her by reciting the crown of the five psalms, the initial letters of which compose her name; nor with giving the habit complete, as they received it on the sacred mountain, to the numerous candidates who applied for it; they also instituted a little habit or Scapular to be worn by those of the faithful who, unable to observe the rigours of conventual discipline, desired nevertheless to participate, as much as possible in a secular life, in the honour and glory of the blessed service of Mary. Close upon the institution of the Scapular came that of the Rosary commonly called of the Seven Dolours of Our Lady, a devotion by which we may condole daily with the most afflicted Mother in her principal sorrows, that is, in the seven epochs of her life, when her maternal heart was most cruelly lacerated by the sword of grief. This Rosary is composed of seven mysteries, in each of which a meditation is made on one of the Seven Dolours of Our Lady, and one Pater and seven Aves are recited in its honour. These seven mysteries are terminated by three Aves in honour of the tears shed by Our Lady during her Dolours. To this has now been added the hymn Stabat Mater, and a Pater, Ave and Gloria in honour of the seven Blessed Founders of the Order. The first rosary of this kind belonged to St. Philip Benizi, and is still to be seen at Todi, where it is carefully kept with the body of this great servant and apostle of the Dolours of Mary, esteemed with reason as almost another founder of the Order of Servites, on account of the extraordinary zeal with which he propagated, with the spread of his Order, the devotion to Our Lady of Dolours throughout the whole of Europe, and even in infidel countries. Click here, to view a section dedicated to the Virgin most Sorrowful. Ye Seven Holy Founders of the Servite Order, pray for us.